La Bomba is a 1-vs.-3 minigame in Mario Party 7. Its name is Spanish for "the bomb", but is also a pun on the Ritchie Valens song, "La Bamba", or possibly the Puerto Rican dance, bomba. The solo player Ground Pounds a switch, opening a gate behind him and dropping a Bob-omb on the team area. One character is on a large platform with moving switches that release Bob-ombs. The other three characters are in a small area with spikes in the middle. The solo character has to Ground Pound the switches to release the Bob-ombs contained in the boxes below them. The gray boxes hold only one Bob-omb, the green boxes hold two, and the red boxes hold four. 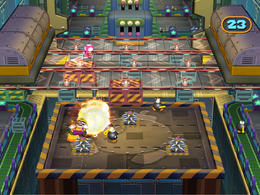 The opponents have to avoid the spikes on the stage and the Bob-ombs being dropped on them. If the solo player can eliminate all of his/her opponents within 30 seconds, he/she wins. The opponents win if even one of them survives. Rules – "One player Ground Pounds to drop Bob-ombs while the other 3 flee." Advice – "The brightly colored crates hold more Bob-ombs than the small gray ones." The Goomba appearing in one of the conveyor belts. This page was last edited on May 8, 2018, at 12:33.